Honeysuckle plants (Lonicera species) are prized for their beautiful fragrance and interesting flowers, which attract hummingbirds to the garden. Unfortunately, these plants also attract gray bug pests looking for host plants. Employ proper honeysuckle care for vigorous plants that are ready to resist or fight off infestations. Familiarize yourself with pests that attack honeysuckles so you're able to recognize symptoms and control the problem. Honeysuckles display clustered, tubelike, highly aromatic blooms in yellow, red, orange, cream, pink or purple hues. Whether in shrub or vine form, honeysuckle plants produce a wide variety of foliage including deciduous, semi-evergreen and evergreen, according to the University of California IPM Online. After flowering, these plants yield berries in either violet or red that measure up to 1/2 inch in diameter. Honeysuckles thrive in locations that offer full sun exposure to partial shade, according to the University of California IPM Online. 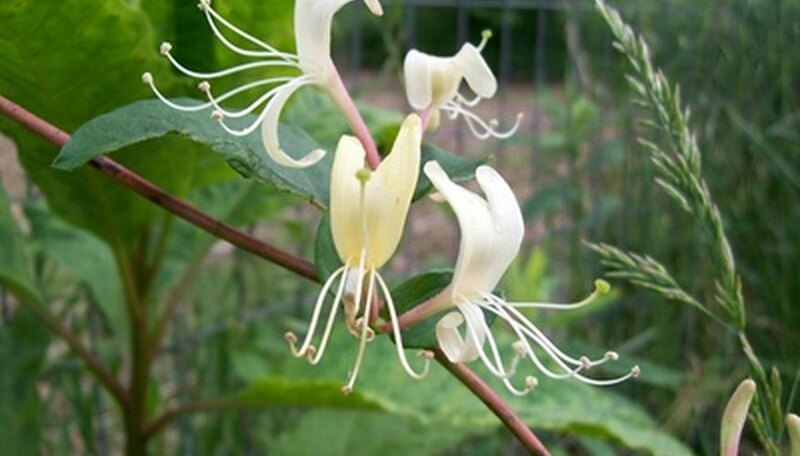 Tolerant to shaded areas, honeysuckle often grows in forests, explains the Virginia Cooperative Extension. Grow in moist, well-drained soil for optimal growth. For appropriate landscape use, plant shrubs as ground cover or hedges that add pleasing fragrance and privacy to your home garden. As vines, honeysuckles are trainable to a supportive structure. Gray bugs found on honeysuckle plants are called armored scales. More particularly, greedy scales often infest honeysuckles. This plant pest has a hard body and, as the name suggests, is a grayish color. The bodies of gray bugs cause some confusion, as they are difficult to recognize as insects; with no visible head, the legless bodies remain motionless, according to the University of California IPM Extension. Scales are referred to as "sucking" pests because they feed by inserting their mouths into plant tissue and sucking out fluids. Though greedy scales generally cause only mild damage, honeysuckle plants may suffer loss of vigor. In addition, when scales feed, they leave a sugary substance called honeydew on plant surfaces. Honeydew attracts a fungi that causes an infection called sooty mold, which is marked by the presence of a blackish moldlike growth that can further damage your plants, according to the University of California IPM Online. For control of gray bugs on honeysuckle, remove and destroy any severely affected plant parts. Natural enemies called parasitic wasps are a biological control method that hunt and kill armored scales; look for these predators in garden supply catalogs or stores. For chemical management, apply horticultural oil to all foliage of the honeysuckle plant, according to the University of California IPM Online.